Looking at the Buffalo Sabres roster for the upcoming season, the team has made a ton of positive changes in virtually every position. They drafted Jack Eichel, landed Evander Kane and Ryan O’Reilly and found a goaltender who they can work with in the future. The Sabres roster has drastically improved, the only question mark is the defence. While the offence is due for a major improvement, the biggest area of concern for the team has been the blueline. The departure of Nikita Zadorov certainly made a big dent on the backend. Obviously not a top four the Sabres feel comfortable icing when they are looking to drastically improve on another brutal season. That left the Sabres searching for an impactful top four defenceman and given the weak defensive options available left the team a tough search. Cue Cody Franson. Shortly after offering Franson an initial deal, Bob McKenzie is reporting that Franson will indeed put ink to paper and sign with the young and exciting Buffalo Sabres on a two-year deal. UFA D Cody Franson is currently in BUF and expected to finalize on Thursday a two-year contract. AAV is expected to be around $3.3M. The news is a huge confidence builder for the Sabres heading into the 2015-16 NHL season. The Sabres are looking to bounce back from a bottom of the league finish in 2014-15 that left them the laughing stock of the league and adding Franson to the blueline helps them solidify their top four. The Sabres will need to juggle around the defensive pairings to get the right-handed Franson the perfect spot, but what he brings to the line-up will be well worth the line juggling. For starters, Franson brings major experience with over 400 NHL games under his belt. Those games include tough minutes in Toronto and playoff games in Nashville. The Sabres blueline is majorly lacking in NHL experience and while it’s great to see guys like Mark Pysyk rise up, the importance of a veteran presence in the line-up can not be overstated. The Sabres had a rough go on the power-play last season where they finished 3oth. Franson is a big-time power-play point man who can serve as the quarterback and trigger man. Considering Franson had more points last season (36) than any two Sabres defensemen combined, this is will be a very welcomed addition. At just 28, Franson still has a lot of game left in the tank and if he’s put in the right situations with the right role, he will excel. He’s an underrated defenceman in a sense and while he might not be the toughest guy, he brings a solid defensive game and an offensive upside to the Sabres blueline. 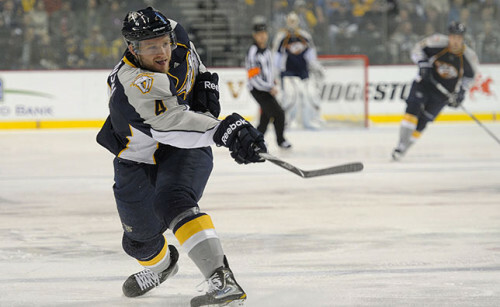 Cody Franson in the Buffalo Sabres top four is just what the doctor ordered for the Buffalo Sabres. This addition is a huge boost to their already boosted team.